I grew up at the knees of some of the South’s great biscuit makers, but a Sicilian taught me how to cook. My senior year at Auburn University, serendipity introduced me to Flavia Mammana, a visiting mathematics scholar from Catania who was working on her doctorate. After a quick introduction over coffee, we decided to live together and signed a lease on a house. Flavia took it upon herself to take care of me, so, as any Sicilian would, she fed me. Constantly. She made pastas, cakes, breads, meatballs, and vegetables lovingly tended over the rental-house stove. But it was her pasta alla Norma, topped with a snowfall of grated ricotta salata she smuggled into the U.S. from Italy, that spoke to my increasingly pudgy little heart. This pasta is the dish of Catania, hometown of Vincenzo Bellini, and is said to take its name from the heroine of one of his most famous operas. The story goes that after seeing Norma performed, friends of the composer were so awestruck they went around describing everything they deemed outstanding as “una vera Norma” (“a real Norma”). 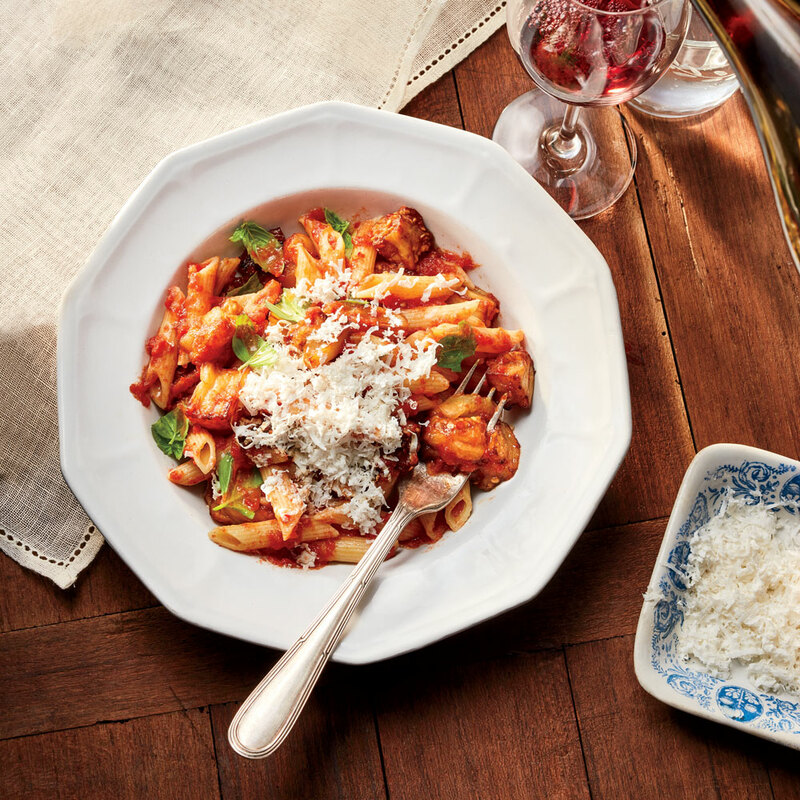 The dish is simple: pasta—often penne, sometimes spaghetti—with tomato sauce; silken nuggets of fried eggplant; aromatic basil; and salted ricotta. But, as with all great dishes, the result is so much more than the sum of its parts. Norma is the kiss of Sicilian summer. It’s a composition that sings of seasonality, when tomatoes and eggplant are at their peak and balconies are overrun with potted basil. To call pasta alla Norma my obsession would be an understatement. If it’s on a menu, I compulsively order it. Through the years, with many, many return trips to this sun-drenched island off the tip of Italy’s boot, I’ve eaten it baked as a casserole, prepared with wide planks of eggplant, in a timbale, deconstructed with modernist flair, and even as arancini. But this version—inspired by Flavia’s mom’s recipe, remains dearest to my heart. Combine tomatoes and onions in a large stockpot over medium. Cook, stirring constantly, until tomatoes begin to release their juices, about 5 minutes. Cover and cook, stirring occasionally, until tomatoes are fully broken down and very soft, about 30 minutes. Using a spider or slotted spoon, transfer tomatoes and onions to a large heatproof bowl; reserve liquid in pot. Place a food mill over stockpot. Pass tomatoes and onions through food mill into stockpot, discarding tomato skins and other solids. Stir in fine sea salt, and reduce heat to medium-low. Cover partially, and cook, stirring occasionally, until thickened and reduced to 7 cups, about 1 hour and 15 minutes. Stir in basil leaves; cook 5 more minutes. Remove from heat, and cover to keep warm. While tomato sauce cooks, heat corn oil in a high-sided skillet or large Dutch oven over medium-high, about 5 minutes. Add 3 to 4 cups eggplant to skillet in a single layer. (Eggplant should be almost fully submerged in oil.) Sprinkle with 1 teaspoon non-iodized salt. Fry, stirring occasionally, until eggplant cubes are golden brown and soft to the touch with a crispy exterior, 8 to 10 minutes. Using a spider or slotted spoon, transfer eggplant to a large plate to drain; reserve drained oil. Repeat with a second batch of eggplant and 1/2 teaspoon non-iodized salt. Repeat with a third batch of eggplant and 1/4 teaspoon non-iodized salt. Fry remaining eggplant, in batches if needed, adding 1/8 teaspoon non-iodized salt to each batch. Cook pasta in a large pot of salted water according to package directions for al dente. Drain. Add pasta to tomato sauce, and stir to coat. Fold in fried eggplant and drained oil. To serve, transfer pasta to a rimmed platter or large shallow bowl. Top with ricotta salata, and garnish with fresh basil leaves. The tomato sauce can be cooked up to 3 days ahead. Let cool, then cover and chill. Reheat before proceeding. Review Body: Way too oily!! Review Body: Love, Love this!!! Tastes like Italy! !